Would you sacrifice a future as a no-name engineer in an MNC for the glory of esports? With its massive population and hundreds of millions of potential gamers, India as an esports market is brimming with potential. And everybody sees it. Unfortunately, not everyone was willing to invest in it. Even today, the concept of professional gaming is alien to most parents and even gamers. Would you be willing to sacrifice a cushy job as a no-name engineer in some massive multinational or would you rather follow your passion, find sponsorship and establish yourself as an esports player? Would friends and family support you in this endeavour? It was questions like these and more that we sought answers to at a panel discussion on the future of esports in India. The panel was moderated by chip-maker Intel, an old hand at esports, and featured the likes of Nodwin’s Akshat Rathee, Asus’ Leon Yu, Intel’s Prakash Mallya and more. Interest in esports is growing rather rapidly in India. Easily the most important point brought up at the event was that esports and gaming aren’t the same thing. Gaming is entertainment, a leisure activity. You fire up PUBG, squad up and get cracking. An esports player, on the other hand, isn’t going to be doing that. They're going to be spending a dozen or more hours a day practicing tactics, figuring out optimal attack vectors and more. As Rathee – gamer, esports fanatic and founder of NODWIN – notes, “Esports is about skill. You stop playing, you lose your edge.” In fact, Rathee claims that pro-gaming is more intensive than cricket. Looking at the evidence, one can understand why. An average South Korean StarCraft II player averages 400 APM (actions per minute) in terms of mouse clicks and keypresses alone. And this doesn’t even include the number of times the player keeps glancing at the map, moves his mouse, talks to teammates, etc. An average gamer manages 50. Pro players simply operate in another league, and they need to if they hope to survive. Rathee believes that there may not be more than 2,000 to 3,000 people in the world who can do that. If India is to get serious about esports, it needs academies, investment, and even changes to policy. PC parts and peripheral maker ASUS, which also has a long history of supporting esports, and boasts of a rich portfolio of gaming products, is already supporting a fully sponsored esports team in India, says Leon Yu, regional director, India, for ASUS. By fully sponsored, Yu means that the company is paying salaries to the gamers, paying for their travel when participating in foreign tournaments, working on convincing players’ parents that pro-gaming is a viable career path, handling their training, and more. Anurag Khurana, head of esports for Reliance Jio, stated that despite the ecosystem for esports hasn’t been established in India yet. Flipkart VP Adarsh Menon again pointed out that parents would want their kids to play games, but not make a career out of it. This attitude, he says, is rubbing off on esports as well. To put things in perspective, an established sport like kabaddi has 200 professional players, the relatively nascent esports can boast of at least 46 in India. Intel India MD Prakash Mallya suggested that all of these are solvable problems. He also observed that building up an ecosystem from scratch is simply not fun. The ecosystem is necessary. The landscape is already changing though. As Rathee notes, 3-4 years ago, esports was entirely distributor driven. Sponsorship for events was conditional on sales. Today, this has changed completely. The conversation is now focused on footfalls, positioning and influencer marketing. Mallya also sees ‘young people’ aspiring for a better experience, something that he thinks will see esports go from a sport to a profession. And as Rathee says, gamers are no longer some nerdy guy locked up in his room, everyone games and the pros are the cool kids. It’s important that the government recognise esports as a legitimate sport because then it would be taken more seriously. That being said, the panelists also appeared quite wary of the idea of involving the government. “If you ask for things from the govt., politics come in,” he said. Regulation is necessary, but it needs to be well thought out and must have the interests of gamers in mind. If recognised, pro-gamer students can even apply under the sports quota. In more esports-friendly countries like Korea, for example, compulsory conscription requirements are relaxed for pros. Mallya also argues that a skill threshold needs to be defined for esports, something that will differentiate a pro gamer from a casual gamer. It’s necessary to “shape the ecosystem journey”, he adds. One very interesting point that was brought up was that India is so large, that even if you do well in one city, you already have a larger audience than you would if you were just starting out in the super-saturated markets of Europe or China. Germany has 37 million gamers. India is predicted to have 628 million gamers by 2020. That’s next year. Just let that sink in for a moment. Even if you capture five percent of that market, it’s a massive number of gamers. Menon also points out that PC gaming isn’t just restricted to major cities. Various Flipkart initiatives to increase sales, such as a Friday store for gaming PCs, are actually paying off because of demand from tier II/III cities. In fact, he claims that these gamers aren’t just settling for entry-level gaming rigs. They’re going for a minimum of 8 GB RAM and mid-range graphics cards. This market has now grown to 20 percent of Flipkart’s gaming PC business. Rathee goes on to talk about how gaming and esports isn’t just about professional gamers. As the interest in gaming and esports increase, job opportunities open up for commentators, game designers, developers, artists, writers, coaches, influencers and more. Gaming and esports in India is also expected to grow 2-5x in the next few years alone. This is far behind China’s gaming market, but it represents great potential. With gaming comes harassment and toxicity. In the western world at least, these are part and parcel of the gaming experience. If you’re a female gamer, you’re immediately treated to a barrage of sexually explicit messages, misogyny and a whole lot of unpleasantness. You’re not welcome in this male bastion. And it’s not just female gamers. Toxicity is rife in multiplayer games. Toxic content includes racial slurs, cussing, doxxing, whining, and so on. Essentially, the gaming gaming isn’t a pleasant, friendly place. In a country like India, which still leans towards archaic social structures and religious extremism, this is a big problem. As the panelists pointed out, however, there’s nothing much you can do to control the behaviour of a 16-year old male teenager. That being said, they point to China for learnings. China, one of the largest, most saturated gaming markets in the world, apparently sees the least toxicity and antagonism towards female gamers. Why? Fifty seven percent of gamers there are women, according to Rathee. If gaming is to be big in India, we need to look for inspiration from the east, not the west. Esports in India is no longer in a nascent stage. 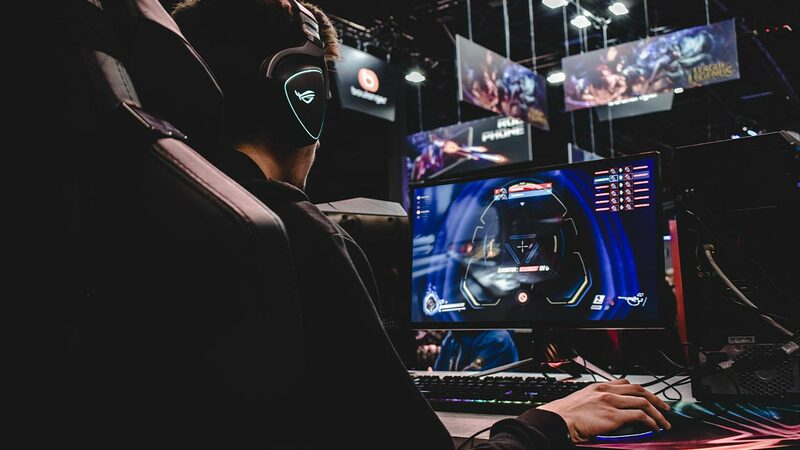 Events like Intel’s ESL One and CBOX Masters have rapidly gained traction these past few years, TV channels and OTT services are looking to cash in on the trend, YouTube Gaming is HUGE in India and Indians are some of its most active members. If we were to just look at the panelists who came to discuss esports (representatives from Intel, NODWIN, Flipkart, Jio and ASUS), the hundreds of thousands – if not millions – of gamers who tune in to watch the events live, the thousands of attendees, it’s clear that esports matters. And it’s here to stay.